“...Can a mother forget her nursing child? Can she feel no love for the child she has borne?" A mother’s love is instinctual, unconditional and eternal. nothing on this side of heaven compares to a mother’s love. In honor of this past Mother’s Day (Sunday May 13, 2018), and every day that mothers around the world do the sometimes thankless work of mothering (wait, too soon for me to say that as a new mom? Oh…) - I want to recognize the four women that walked with me through my pregnancy and that have been living examples of a mother's love in my life. Long before I became her daughter by law, my mother in law decided to love me like one of her own children. She has been a second mother to me in every way - My. Other. Mother (MOM). Throughout my pregnancy she called to check up on me, reminded me to take it easy, and took every opportunity to be in her son’s ear, encouraging him in his duties as husband and father. The day I went into labor, she was in town for a weekend with her sisters, but she dropped everything to be there for the birth of her only son’s son. She met us at the hospital about 20 minutes after Danny and I arrived. She walked the labor and delivery unit with me, until my own mother came to join us. And although, I have always been able to lean on her proverbially speaking, I literally leaned on her during the early pushing stage. She accepted, which was a very big deal for the little girl who had no older biological siblings to look up to. And my sister has never walked out of my life since that fateful day in a small, storefront church. She has lived up to her role as big sister in every way - she has been a role model, inspiration, encourager, confidante, and more—remaining strong for me in my moments of weakness. As busy as my sister is, she made it a point to check-in on me almost daily during my pregnancy. She surprised me one weekend with my mom, only about a month after I told them I was expecting. And on a particularly tough day for me, she stopped in the middle of a presentation on a retreat she was leading to talk to me and calm me down via telephone. And though she couldn’t be at my side, when I gave birth, she made sure that my mommy (who was with her at the time and almost 1000 miles away) did make it. Malachi wasn't even 2 weeks old before she came to meet him and just be by my side. It's impossible to repay her for all she's done for me over the years, but I'm so grateful that I get to call her my sister. Of all the women on this list, my mom is the one who has had to deal with the full brunt of my pregnancy and post-partum hormonal vacillations—Up. Down. Fine. Frustrated. Happy. Sad. Confident. Frightened. Faith-filled. Doubtful. All of it. And that’s because as a good mother, as my mother, she has just always been there. From the moment she brought me into this world, up until now—a month after I brought her grandson into this world—my mother has been there. As a child that lacked serious understanding of the preciousness of the mother-daughter relationship, I didn’t always treasure, or even acknowledge, how present she was—or how hard she worked to be there (for her children and family, and for other people and their children as well). But now that I have a child of my own, now that I have seen her dote on her first grandchild, I have a better understanding of the unconditional love that fills her heart when she looks at me. And I’m just grateful that I woke up to the fact that she is a walking, talking blessing that God has graced this earth with. She has become irreplaceable. From insomnia-inspired calls from me in the middle of her nightshift at work throughout my pregnancy, to holding my hand and letting me lean into her as I fought through those final pushes, to mothering me with tough love as I adjust to motherhood and wade through the murky waters of life post partum, my mommy has walked with me every step of the way. The other women on this list may have had the opportunity to be more hands-on physically, but no one had me more covered spiritually than my grandmother. If my grandmother knows nothing else, she knows how to pray. And let me tell you, there’s plenty this lady in her late 70s knows, including how to text and navigate Facebook. In her prime she was an entrepreneur with her own shop. But all of that pales in comparison to her ability to wholly give herself to prayer. She covered me in prayer before I took my first breath, and the same is true for Malachi. I can’t tell you how many days and nights she has spent on her knees (now vitiated with older age), bowed low, on her face before the Lord, for me, for health throughout my pregnancy, for a safe delivery and a healthy baby, and for God’s guidance as Daniel and I to raise Malachi. There were words of wisdom and encouragement through weekly texts and calls throughout my pregnancy. And once the dust of giving birth settled, there has been daily communication inquiring about everyone's well-being. Like the caricatures painted through song in Nina Simone’s iconic tune "Four Women," each of these women are different, with unique stories of their own. The respective beginnings of their own motherhood journeys have been filled with their own challenges, “mama guilt,” and triumphs. Pregnancy in general helped me to appreciate the community of women, and mothers in particular, that I have around me. 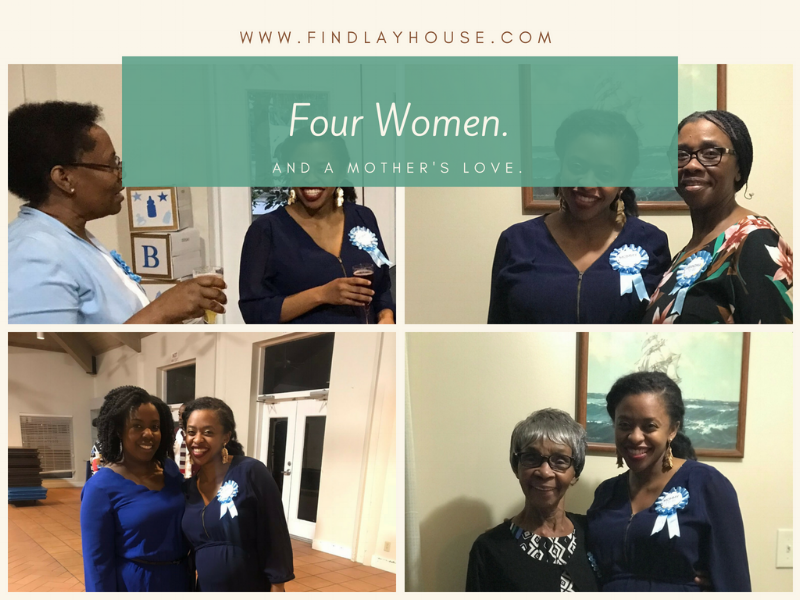 The four women above were certainly pillars throughout my pregnancy, but there were a handful of other ladies (aunts, mother-figures, and friends) who celebrated with me and regularly checked up on me, and for that, I am forever grateful.